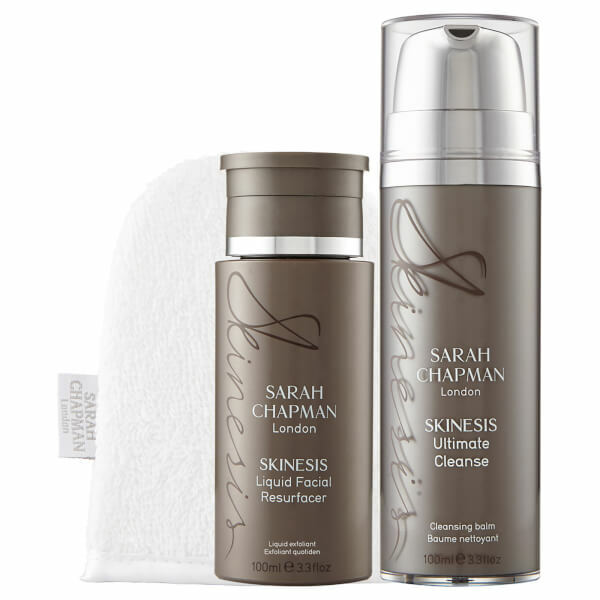 Reveal fresh and dewy skin with The Ultimate Cleanse Duo from Sarah Chapman. The skincare pair brings together two anti-ageing formulas to sweep away impurities, restore balance and deliver a healthy glow. Includes a cleansing mitt. An anti-ageing balm-to-milk cleanser that works to lift away stubborn makeup and impurities whilst softening and brightening the skin. With an intelligent formula, the cleanser combines Omega-Rich Oils and powerful antioxidants to gently exfoliate and clean deep into pores to eradicate grime, dirt and makeup; expertly decongesting to leave your complexion clean, revitalised and glowing. A complexion-correcting liquid that leaves behind glowing, balanced, and blemish-free skin. The daily use formula targets signs of ageing, sun damage and problem skin to help to dissolve dead cells, tighten pores and visibly reduce fine lines and redness. A carefully calibrated combination of face-friendly acids negates the need for harsh exfoliation and results in a tightened, unclogged and refined skin texture. Limpiador facial: masajear la piel seca con una dosis (incluyendo el contorno de los ojos), permitiendo que el bálsamo acabe con todas las impurezas y el maquillaje. Emulsionar con agua tibia hasta conseguir una leche limpiadora y retirar con las manoplas de limpieza profesional húmedas. Evitar el contacto directo con los ojos. Si se sienten molestias, aclarar con agua templada. Solo para uso externo. Tratamiento de renovación facial: por la mañana o por la noche, después de la limpieza, distribuir sobre la piel limpia con un disco de algodón. Ultimate Cleanse: Isopropyl Palmitate, Caprylic/Capric Triglyceride, PEG-20 Glyceryl Triisostearate, Cetyl Ethylhexanoate, Sorbitan Oleate, PEG-10 Laurate, Hydrogenated Castor Oil, Ceteareth-6 Olivate, Prunus Amygdalus Dulcis Oil, Cera Alba, Decyl Glucoside, Crambe Abyssinica Seed Oil, Limnanthes Alba Seed Oil, Simmondsia Chinensis Seed Oil, C12-15 Alkyl Benzoate, Stearalkonium Hectorite, Aqua, Cinnamomum Camphora Bark Oil, Limonene, Alcohol, Propylene Carbonate, Tribehenin, Tocopheryl Acetate, Ubiquinone, Citrus Aurantium Amara Flower Oil, Eucalyptus Globulus Leaf Oil, Adansonia Digitata Seed Oil, Borago Officinalis Seed Oil, Cananga Odorata Flower Oil, Ceramide 2, PEG-10 Phytosterol, Rosa Canina Fruit Oil, Linalool, Cedrus Atlantica Bark Oil, Citrus Aurantium Bergamia Fruit Oil, Citrus Aurantium Dulcis Peel Oil, Anthemis Nobilis Flower Oil, Citrus Limon Peel Oil, Citrus Nobilis Peel Oil, Citrus Aurantium Amara Leaf/Twig Oil, Lavandula Angustifolia Oil, Glycerin, Lilium Candidum Bulb Extract, Myrocarpus Fastigiatus Oil, Jasminum Officinale Flower Extract, Rosa Damascena Flower Oil, Acacia Decurrens Flower Extract, Retinyl Palmitate, Palmitoyl Hexapeptide-12. Facial Resurfacer: Vitamin A, Vitamin D3, Vitamin E, Flax Seed, Sea Buckthorn, Omega 7, Riboflavin, Magnesium, Niacin, Vitamin B12, Vitamin B6, Biotin, Folic Acid, Vitamin C, Zinc Gluconate, Copper Sulphate, Selenium Amino Acid Chelate, Silica, Iodine (from Kelp), Lutein, Lycopene, Hyaluronic Acid, Choline, Coenzyme Q10, Lavender, Hops, Resveratrol, Black Pepper.